Elk are large, hooved grazing animals who bear a resemblance to deer. 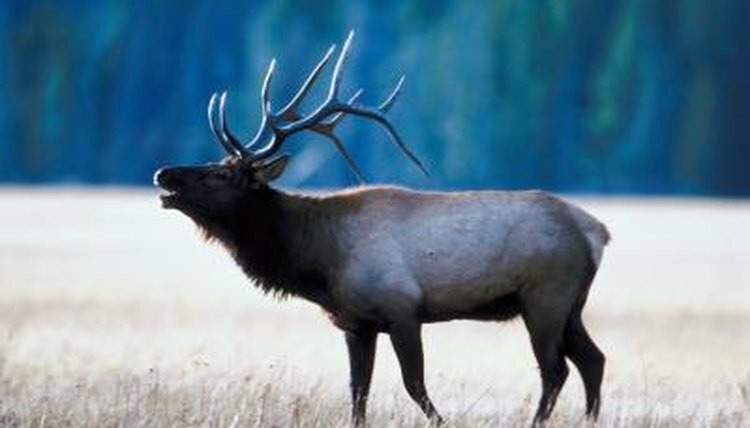 North American elk have four existing subspecies. Like deer, elk are characterized by the antlers on the males and the split hooves of both genders. Elk are much larger than North American deer, standing between 4 and 5 feet at the shoulder. They bear distinctive patches of lighter hair on their rumps, surrounding their tails. The term ungulate roughly translates "hoofed animal." Ungulates are divided into even-toed and odd-toed groups. Elk are members of the order Artiodactyla, even-toed ungulates. Unlike odd-toed ungulates, which support their weight on the third digit of each foot, even-toed ungulates bear their weight on their third and fourth digits. Like the other members of the creature's evolutionary order, North American elk have no first digit. Depending on the species in question, even-toed ungulates may also have one or two dewclaws, which are vestiges of their second and fifth digits. Three kinds of stance exist: plantigrade, digitigrade and unguligrade. Both the heel and the toe touch the ground in the plantigrade stance. Humans have a plantigrade stance. Animals with the digitigrade stance, like dogs and cats, walk on their toes. Animals with the unguligrade stance walk on the very tips of their toes. Elk do this. The unguligrade evolutionary adaptation may have occurred to give the prey animals longer, more flexible limbs with an additional joint. The first digit, corresponding to the thumb, would have been the first to disappear. The second and fifth digits would have shrunk, becoming shorter and weaker over time. As these digits became smaller, the third and fourth digits grew larger and stronger. The soft tissue between these digits became tougher, evolving into ligaments rather than muscles. These ligaments hold the two digits tightly together, giving the illusion, on elk, of having a single but divided digit. In addition to the two primary digits, North American elk have two dewclaws. These dewclaws only occasionally leave visible impressions in the elks’ tracks. Elk tracks are symmetric. They're similar to deer tracks but are substantially larger, averaging about 4 inches and sometimes reaching 5 inches across the pair of digits. Elk tracks also have a somewhat more rounded appearance than deer tracks. The walking stride of the North American elk places the imprint of the rear foot almost completely inside the imprint of the front foot. The elk’s running gait results in a wedge-shaped space between the two toes due to the force with which the foot hits the ground. Domestic cattle tracks can be confused with elk tracks. They are about the same size, but cattle tracks usually are more elongated than elk tracks and have a less regular appearance. At one time, North American elk range covered the continent. Elk are now extinct east of the Mississippi River, in the American Southwest and in Mexico. The Manitoban elk is the northernmost subspecies, being found in the northern Great Plains of Canada. The Rocky Mountain elk has the largest antlers of all elk subspecies; the Roosevelt’s elk has the largest body. The Tule elk is the smallest of all of the six subspecies. The Ultimate Ungulate: Order Cetartiodactyla: Even-Toed Ungulates ... and Whales!